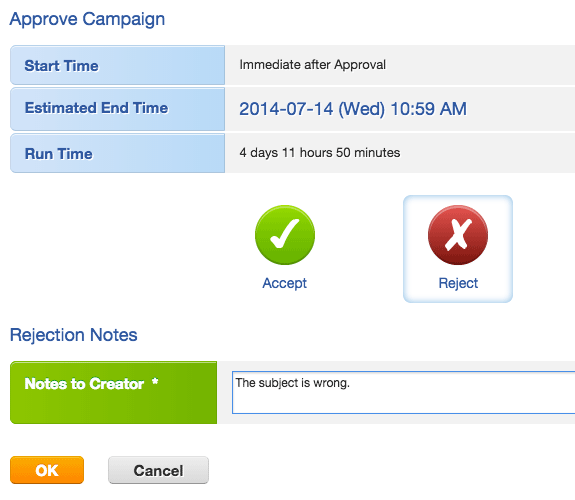 By default, all user can create email campaigns without approval. If you want to set up the approval mechanism, you need to define suitable [User Roles] for [Approver] and [Campaign Creator]. Emarketer who needs to seek approval on campaign execution. Emarketing Manager who has the right to approve campaign. When you create a new user or modify an existing user account, select the suitable user role. If you want to change other user role to be Approver and Campaign Creator with Approval, you need to grant the Approver the [Approve Email Campaign] function, and grant the Creator the [Create Campaign with Approval] function in [User Role Settings] - [Function List]. Learn more about user role. If an email campaign need approval, it will not start until the approver accept the campaign. This campaign is waiting for approval. Once Approver accept the campaign, it will start on time. This campaign is rejected by Approver. Creator need to modify and re-schedule it again. 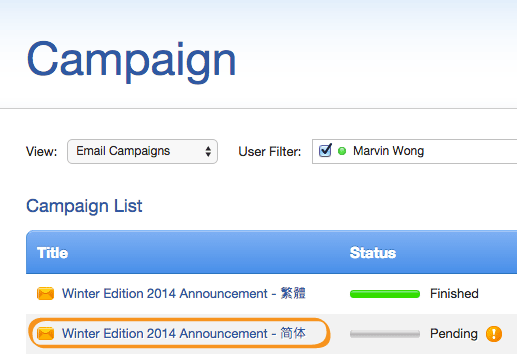 Step 1: Go to "Campaign Report"
Enter the [Campaign] section, click the campaign name in the campaign list. 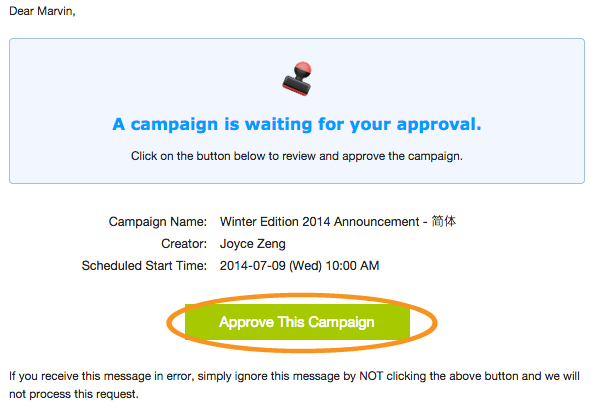 Click the [Approve This Campaign] button in Approve Campaign Alert Email. After login, you will directly go to the [Campaign Report] page. Review the email content. And then click [Approve Email Campaign] at the top right corner. In [Approve Campaign] panel, it will show the [Start Time], [Estimate End Time] and [Run Time] of the campaign. If you accept both the email content and the campaign schedule time, select [Accept], then click [OK]. The campaign will start on time after you accept it. System will send out the Acceptance Alert email to the Campaign Creator and CC to you. If you do not agree with the email content or the campaign schedule time, select [Reject], then mark down the disapproval reasons in the [Notes to Creator], then click [OK]. System will send out the Disapproval Alert email with the Notes to Creator to the Campaign Creator and CC to you. 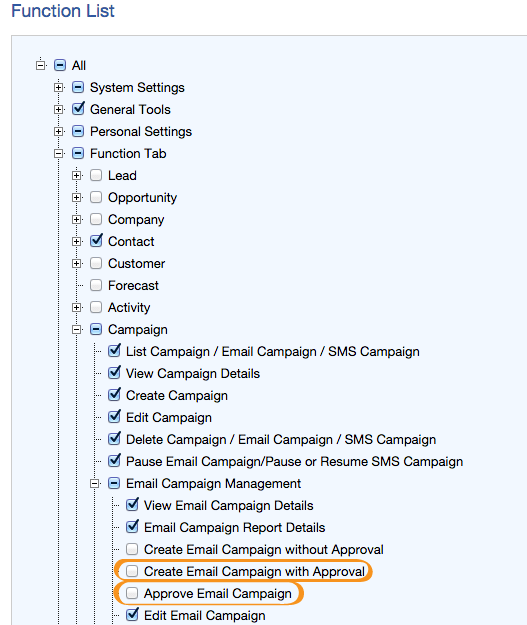 Enter the [Campaign] section, and click [Create Email Campaign]. Follow Step 1 to Step 10 in Send An Email Campaign. 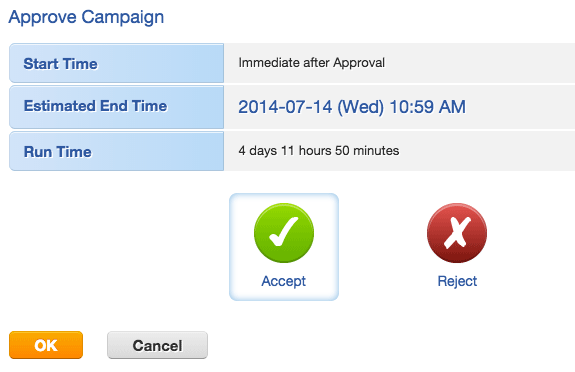 You can choose [Immediately after Approval] to send the campaign immediately after the Approver accept the campaign. Otherwise, you can choose [Schedule] to start the campaign at a later time. Once the Approver accept your campaign, the campaign will start on the schedule time. 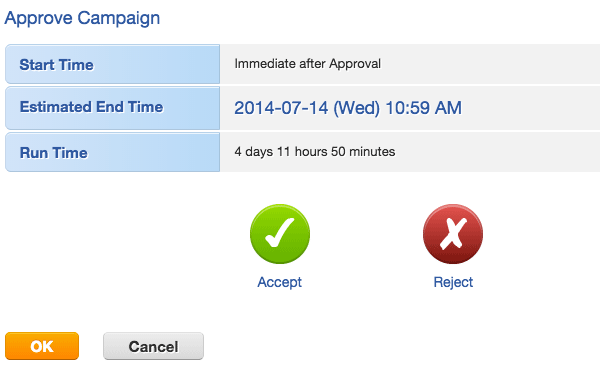 Select the approvers who you want to send an Approve Campaign alert email to remind them approve your campaign.